I don’t know if hubby and I could ever get bored of all the back road day trips we make. We stay in Central Florida and not driving that far from home. 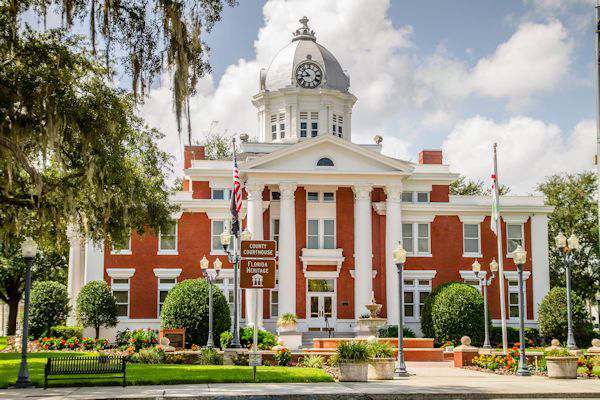 Our latest trip took us through 3 counties and 3 different small towns centered around old historic courthouses and so authentic Florida. The first town we traveled to was Dade City in eastern Paso County. A beautiful and quaint small town surrounded by citrus groves and farms. The courthouse is located in a town square with several small shops and restaurants surrounding it on all four sides. A classic Greek revival style courthouse from 1909. 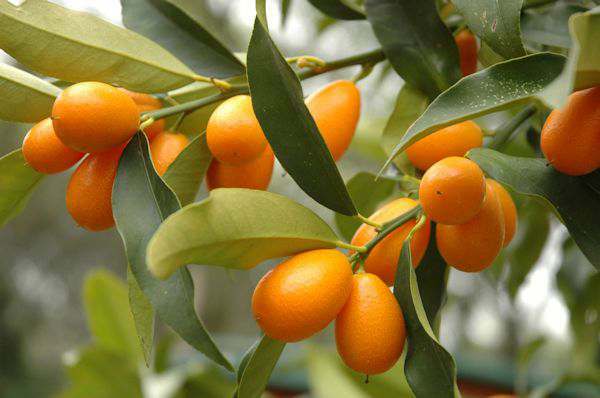 Known as the Kumquat capital, you can find these trees dotted several places around Dade City. Kumquats are a small citrus fruit really tastes good in recipes such as pie. I’m not a fan of them by themselves. There is an Annual Kumquat Festival which is held in late January. A great time to visit Florida. Be sure to visit the restaurants around the town square for some great home style cooking for that area. 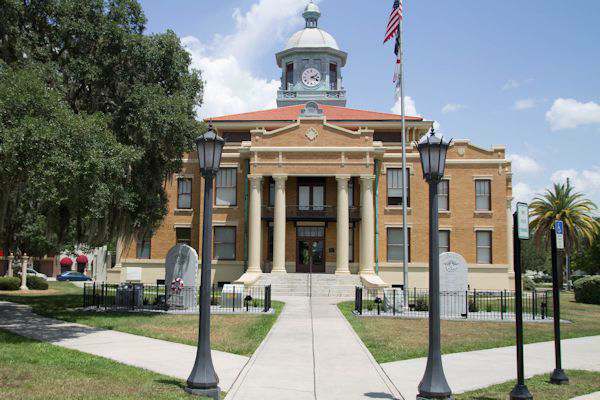 Just a few miles away in Hernando County is Brooksville, Florida. 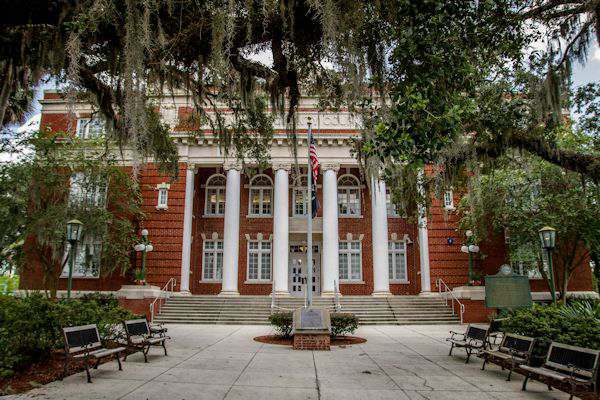 The canopy of old live oaks is found every where in this quaint small Florida town. 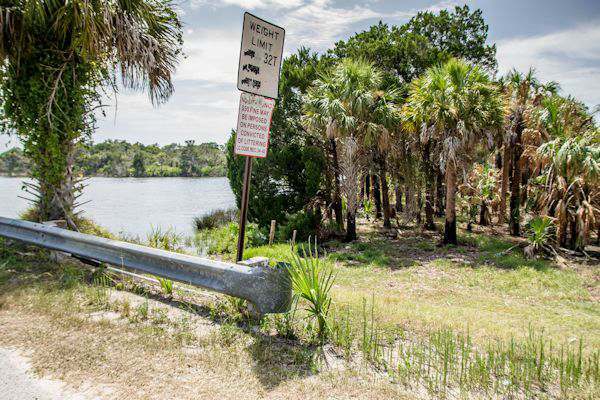 Visitors can choose from many options, like the old Florida theme park of Weeki Wachee, to biking the Withlacoochee State Trail and to fishing in its waterways which also attract spectacular birds. 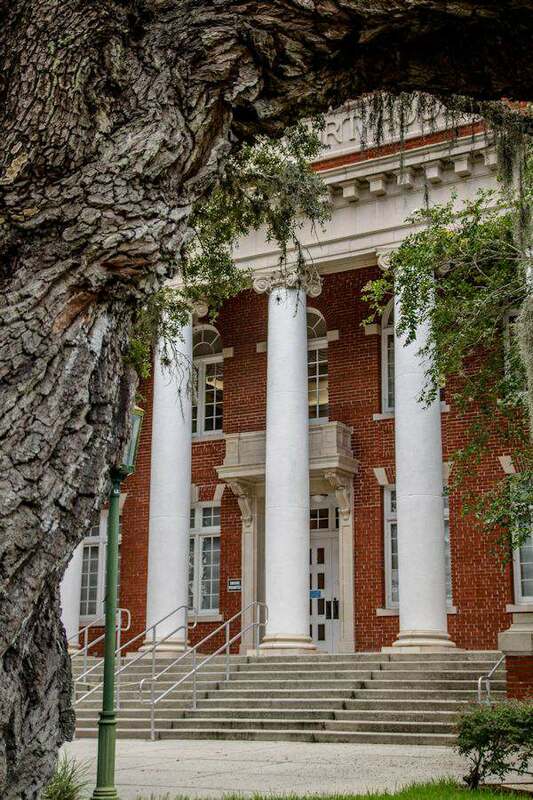 The 1913 Brooksville Courthouse is another fine example of Greek revival architecture which many courthouses were themed after in the US. Centered in the middle of historic downtown Brooksville surrounded by many eateries and shoppes. Hernando County is also known for all its blueberries and several U-Pick farms. There is also an Annual Blueberry Festival to enjoy in April. The last town we visited was Inverness in Citrus County just 75 miles from Tampa. The stunning 1912 courthouse was restored by the community and is now a Heritage Museum. There are several artifacts from the local springs to view in the museum. Several restaurants and interesting old world shops are located in historic downtown. The Withlacoochee State Trail also has access in Citrus County and the trail is mostly shaded and generally flat, which is great for beginner hikers and bikers. Since I was born and raised 3 hours from where Elvis Presley lived at Graceland, I am a huge fan. 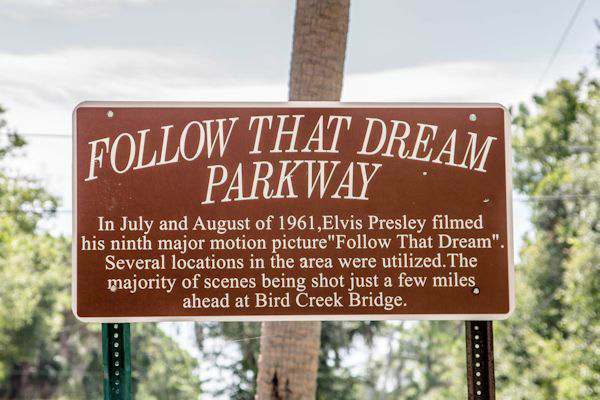 In July of 1961, the movie “Follow that Dream” was filmed in parts of Citrus County and I just had to go and see where that area was located. 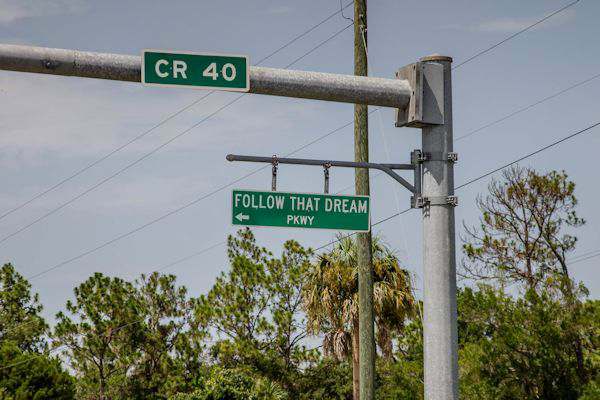 Its really not hard to find since the county road is named “Follow that Dream”. Located near Crystal River and Yankeetown where we had visited on another trip of Untouched Florida. The sign marking the road and area where the movie was filmed. Thick underbrush was cleared on a point of Pumpkin Island near the bridge over Bird Creek, as shown in the 2 pictures above. Tons of sand was brought in to make it look like a nice beach area. Palm trees were also planted in the area which most died before filming could start. But after 50+ years, it has become over grown with palm trees, brush and large trees. I have to admit, it was fun standing where Elvis made one of his movies. At the end of the day, we stopped by one of our favorite restaurants called Charlies Fish House and Restaurant where they serve fish caught daily in the area. What a beautiful view to enjoy while eating dinner. Check out this fish!!! 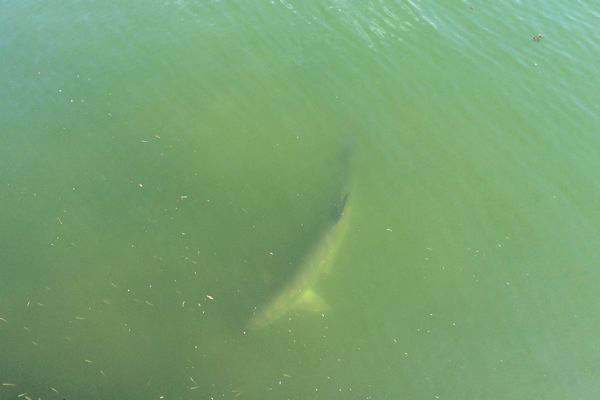 Its called a tarpon and are 4–8 ft long and weigh 60–280 lbs!! It was huge. They hang around the restaurant for the leftover bait not used by fishers. I understand that tarpon isn’t a fish you want to eat but if you love a challenge when fishing, this is the fish for you. 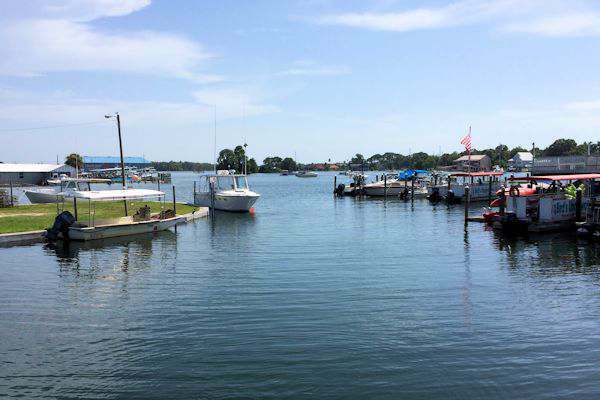 Another city located a bit south is called Tarpon Springs which was named after that fish and is very abundant in the Citrus County area. How cute that there is an Annual Kumquat Festival. I have never even had one… nor have I ever watched an Elvis movie before. Wow, those courthouses are lovely! I can’t believe they are still that pretty despite their “old age.” You sure had a great experience of having to stand in the same spot as Elvis Presley! I wish I had that chance too! Thanks for sharing your story. I enjoyed reading this post. Very cool that you got to be where Elvis filmed. He was such a hottie 😉 And I love anywhere in Florida! Wow! Elvis! This is exciting to be able to visit one of the places where he filmed his movie. I love finding out fun tidbits of information like this. The festival sounds like so much fun too! I really enjoy going to places like this, it’s not just a blast from the past but you get to experience so much of their history too. 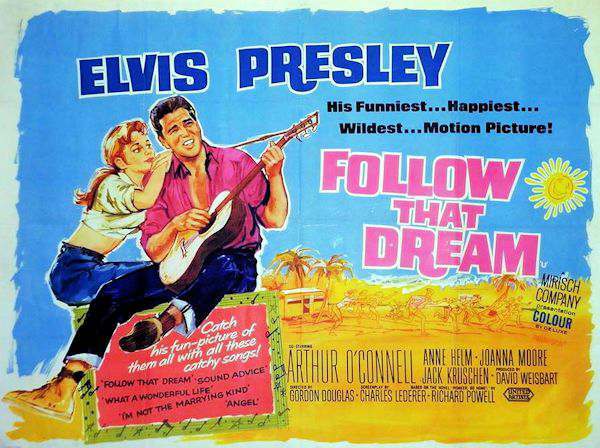 It’s awesome that Elvis filmed here as well, it’s perfect for fans! Wow, that fish is so huge! I want to go there too when my son grew up a little older. There are many great towns at Florida. That place looks really refreshing. I haven’t been to florida yet but it’s definitely on my bucket list.